After the Spanish American War, America took possession of the Philippine islands and waged war against the native people killing more than two hundred thousand. This went on until World War II. In fact, the treatment of American Indians hasn’t changed much. The United States government might not wage brutal war against Native American Indians today as they did in the past, but in recent times billions of dollars slated to support Native American Indian tribes on reservations went missing, and no one seems to know where all that money went or care, except the Indians. It would appear that the era of lies and broken treaties has not ended. If you want to learn more about American Indians, I suggest you read what the New York Times said about the work written by Vine Deloria Jr., and check out Native American Literature worth reading. It’s best to stay away from Hollywood if you want to get closer to the truth. It is always good to have the facts before passing judgment, and history does count. This entry was posted on Tuesday, February 16th, 2010 at 08:00 and is filed under America, American culture, China, Chinese Culture, Christianity, government, media, politics. You can follow any responses to this entry through the RSS 2.0 feed. You can leave a response, or trackback from your own site. Hi, I was wondering who I can contact to find the owner of the image of the American flag flying over Fort Santiago? My company is writing a book and would like to include that image. I’m sorry. I don’t have that information. I think you may be talking about the Fort Santiago in Manila in the Philippines during the Spanish-American War. But correct me if you are talking about the other Fort Santiago in Veracruz that was occupied by US forces in the Mexican-American War. 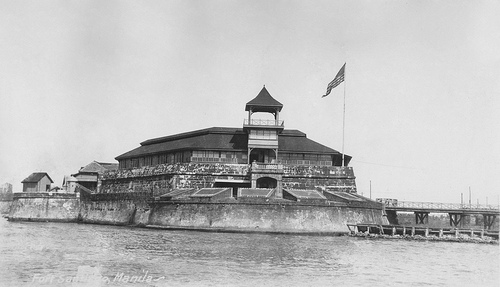 The American flag that flew over Fort Santiago in Manila was first raised on August 13, 1898. The Fort Santiago in Veracruz, Mexico was considered one of the strongest fortresses in the Western hemisphere at the time. It fell to US forces on March 29th, 1847. There were actually three forts guarding Veracruz and Santiago was one of them.